Garlic, this is a staple in most kitchens, a delicious and easily identifiable ingredient that enhances so many dishes that we enjoy. 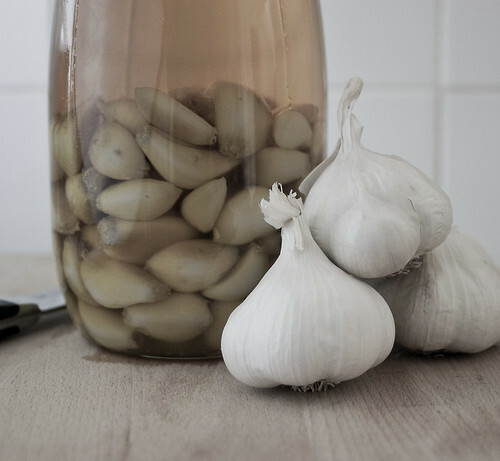 At home, we have started making a simple garlic confit which makes using this essential ingredient that bit quicker and easier. Of course there are some recipes where the fresh pungent flavour of the whole cloves is still best, but we have found that many, in fact, most of our meals benefit from the lighter touch of a clove or two of confit garlic and a drizzle of its' aromatic oil. 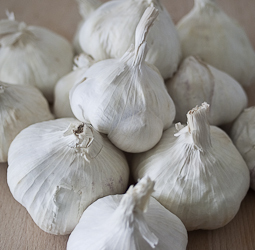 Thomas Keller advocates the use of garlic confit in many of his dishes and gives a method for this, along with other confit concepts in his book Bouchon. In our kitchen a jar of confit garlic sits to the right of the gas hob alongside some freerange eggs, a pot of sea salt, a lemon, a couple of lighters (to light our broken hobs), a pepper grinder, some honey and - at present - a jar of fennel-infusing vodka (which really should be stored in a dark cupboard instead). With just a little bit of work every few weeks, it is possibly the most useful ingredient in our kitchen especially as it speeds up the process of making a quick evening meal dramatically. But there are just 3 cloves left at the bottom of our jar, so it is time to make some more. It can be a bit fiddly to make as each clove of garlic should be peeled completely before use, but I have found a slightly easier method of making which at the same time saves your finger nails from the inevitable spikes of garlic skin which wedge just under the nail and hurt like hell as you peel. So get yourself three or four heads of garlic, separate out the heads of garlic into individual cloves and remove the outer layers of paper by rubbing. At this point try your cloves in the jar you are planning to use, to ensure they fit, then wash and sterilise the jar. Place all the cloves into a large saucepan and cover with boiling water. Simmer for a couple of minutes until you see the odd pieces of skin floating to the surface. Drain the cloves and put them into a bowl. Now the outer skins should separate really easily, so with wet fingers (to stop the skin sticking to you) take the rest of the skins off and pile the cloves onto a piece of paper towel to dry. Soon you will find yourself with a heap of naked white cloves ready to be preserved in oil. Pop the garlic back into the large saucepan and cover with oil, I use a cold pressed olive or rapeseed oil. If you are a keen user of infused oil, you can add more oil to the pan, perhaps an inch above the level of the cloves. This will give you extra oil to bottle later on. Heat the garlic and oil until the oil begins to boil, now turn the heat down to a very low simmer. Leave the garlic simmering gently in the oil for around 40 minutes. The cloves should be soft and tender but still pale and creamy. If you are a fan of caramelised garlic, you can cook the garlic at a slightly higher heat, to create a more caramelised clove. It is very much personal taste as to which you prefer. 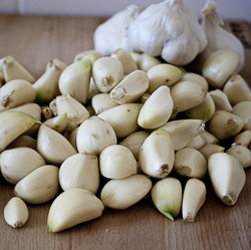 We use a spoonful of oil and a clove of preserved garlic in virtually every savoury dish we make. I love the simplicity of use as well as the rounded and more subtle flavour of the preserved garlic, just mash a clove onto the pan using the back of a spoon or spatula and you are done. As it is already cooked, we don't need to worry about preparing and cooking the garlic before adding to a dish and that harsh flavour you can get if the garlic isn't cooked through is no longer an issue. Personally, I don't find caramelised garlic as useful in the kitchen though I love it in it's own right. I certainly couldn't use a whole jar of caramelised garlic withough having to get seriously creative. Occassionally I will roast a head of garlic wrapped in foil in the oven, then keep this in the fridge squeezing the cloves as I need them into sauces, mayonnaise or just onto a cracker for a snack. Oh Kate thank you for this, a fantastic idea. I will be doing this, but not looking forward to the peeling involved. This is interesting - what kind of oil do you use? What a fantastic idea indeed and very timely. We're just getting to the point when what's left of our garlic crop is starting to sprout so preserving them in olive oil will stop them going to waste as well as being very handy. Brilliant, Kate! I'm definitely going to do this. Kath, I peeled whilst listening to Desert Island Discs on Sunday morning but blanching them in water really helps speed up the process. Janice, this time I used a cold-pressed rapeseed oil. It has quite a strong and grassy flavour when used neat but this is really softened by the garlic. Alternatively it is very good with supermarket EVO. Choclette & Wendy, you had better get peeling! Giles. Sorry! my timing is obviously out. Hurry up and use your bought oil and then try it. sounds fantastic I think next time I'm up the high-street the Indian veg shop might be a bit shorter of garlic!